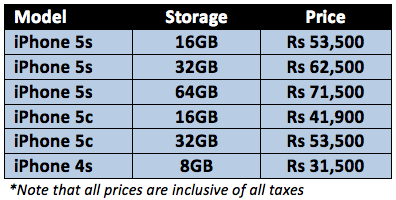 Apple has finally put an official launch date and pricing for India against its new iPhone models. The devices will be launched in the country on November 1. While the iPhone 5s will be available for a starting price of Rs 53,500, the iPhone 5c will be available for as low as Rs 41,900. Also, the company has done away with the 16GB and 32GB models of the now ancient iPhone 4s, and its 8GB model will be available for Rs 31,500. Telecom operators like Airtel and Reliance Communications have already announced that they will be offering exclusive plans for the iPhones. In addition to India, the smartphones will also be made available in 15 additional countries next month that include Albania, Armenia, Bahrain, Colombia, El Salvador, Guam, Guatemala, Macedonia, Malaysia, Mexico, Moldova, Montenegro, Saudi Arabia, Turkey and UAE. 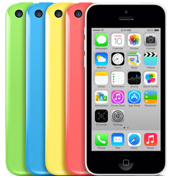 Apple has also announced the prices of the tailor-made cases that it has launched for both the models. While the iPhone 5s case will be available for Rs 3,200, the price of the iPhone 5c case is Rs 2,300. The iPhone 5c cases come in six hues (black, white, pink, yellow, blue and green) with a design that allows the colour underneath to show through, creating 30 colour combinations possible. In comparison, the iPhone 5s case also comes in six different colours (brown, beige, black, yellow, blue and red). In comparison to the iPhone 5c case that is made of silicone, the iPhone 5s case is made of leather. Even before the official launch, the smartphones were already available in the grey markets and a number of e-commerce sites in the country, albeit for an exorbitant pricing that went upwards of Rs 1 lakh. Also, it is after a long time that the company has moved away from its standard pricing of Rs 45,500, Rs 52,500 and Rs 59,500 for the 16, 32 and 64 GB models respectively. While the new iPhones will definitely find a lot of takers in the country (its just the brand loyalty Apple commands), we feel that the company has failed miserably in pricing the devices right. The ideal situation would have been that the iPhone 5s would have replaced the existing iPhone 5, and the iPhone 5c would have been priced at between Rs 30,000 to Rs 45,000. Here is a quick look at specifications of the devices. The device sports a 4 inch widescreen multi-touch retina display (1136Ã—640 pixel resolution) with 326 ppi pixel density. It is powered by the next-generation A7 chip with 64-bit architecture and a M7 motion coprocessor. As far as internal memory goes, Apple has stuck to the same 16, 32 and 64 GB combination. The smartphone features an 8 megapixel autofocus rear camera with True Tone Flash that can record full high definition videos (1080p) at 30 frames per second and a 1.2MP front-facing camera that can also record HD videos (720p). As for connectivity, the device has Bluetooth 4.0, Wi-Fi, 3G and 4G LTE. It measures 123.8mm x 58.6mm x 7.6mm and weighs 112 gm. According to Apple, the battery will provide up to 10 hours of talk time on 3G, 10 hours of video and Wi-Fi browsing, 40 hours of music and over 10 days of standby time. The device supports a Nano-SIM and hence will not be compatible with existing micro-SIM cards. Apart from the usual silver and space grey colours, Apple has also added a gold version of the iPhone. A new feature addition in the form of 'Fingerprint identity sensor' has also been done by Apple. This one also has a 4 inch widescreen multi-touch retina display (1136Ã—640 pixel resolution) with 326 ppi pixel density. It is powered by the A6 chip and in terms of internal memory, users will only have a choice between 16 and 32GB versions (no 64GB). The smartphone features an 8 megapixel autofocus rear camera with LED Flash that can also record full HD videos at 30 fps and a 1.2MP front-facing camera that can also record HD videos. As for connectivity, the device has Bluetooth 4.0, Wi-Fi, 3G and 4G LTE. It measures 124.4mm x 59.2mm x 8.97mm and weighs 132 gm. According to Apple, the battery will provide similar talk time, video playback and stand by time as iPhone 5s. This one also only supports a Nano-SIM and will be available in a number of colours that include red, white, yellow, blue and green. Read here to know about the detailed specifications of iPhone 5s and 5c.